Life In A House of Blue ! : 30th Birthday of the Happy Meal-Welcome back Teenie Beanie Babies & The 10 Happiest Cities ! Home > press > 30th Birthday of the Happy Meal-Welcome back Teenie Beanie Babies & The 10 Happiest Cities ! 30th Birthday of the Happy Meal-Welcome back Teenie Beanie Babies & The 10 Happiest Cities ! In honor of the 30th Birthday of the Happy Meal, McDonald’s brought back one of its most popular Happy Meal toys ever – Ty® Teenie Beanie Babies® plush toys. Now through August 13, customers will receive one of 30 different Teenie Beanie Babies with their Happy Meal purchase. 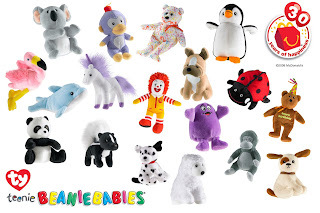 Each Teenie Beanie Baby plush toy features its own name tag and includes a special code that unlocks a unique 30th Birthday xperience on McWorld®, McDonald’s virtual world at www.happymeal.com, and unlocks a fun play online experience on Beanie Babies 2.0™, Ty’s virtual world at www.ty.com. To celebrate this milestone, McDonald’s commissioned a survey to find the Top 10 “Happiest Cities for Families” in America. They announced the results during a birthday celebration last Friday in the “Happiest City” – Minneapolis. The event included Ronald McDonald, a larger-than-life Happy Meal box-shaped cake, and “Happiness Ambassador” and Olympic Gold Medalist, Shawn Johnson. My granddaughter just loves getting Happy Meals and the little toys. This would be a very popular toy with my kids. I think they have way too many stuffed animals, but they just love them. Although those Beanie Babies are adorable! My girls have already gotten a few of these from road trips we've gone on... I HATE THEM! lol actually I hate all happy meal toys, too much clutter and normally just get thrown away.